Based on what’s been happening, those of us who have been warning about the fiscal burden of Medicaid, Medicare, and Obamacare could rest on our laurels and say “we told you so.” But it’s a Pyrrhic victory because being right means bad news for the country. Earlier this year, The Hill reported some very sobering news about the ever-growing burden of health entitlements. Spending on federal healthcare programs outpaced spending on Social Security for the first time in 2015, according to an expansive report from the congressional budget scorekeeper released Monday. The government spent $936 billion last year on health programs including Medicare, Medicaid and subsidies related to the Affordable Care Act, a jump of 13 percent from 2014, according to the Congressional Budget Office. Spending on Social Security, in contrast, totaled $882 billion, the Congressional Budget Office (CBO) reported. Let’s look at just one example of why the fiscal burden of health entitlements keeps growing so rapidly. According to new data, the portion of Obamacare that expanded Medicaid is generating a torrent of new spending. Charles Blahous is a former Trustee for Social Security and Medicare Given his inside-the-belly-of-the-beast familiarity with entitlement programs, what he’s written should be especially alarming. The implementation of major legislation such as the Affordable Care Act (ACA) often results in fiscal outcomes that differ significantly from prior projections. …Recall that the ACA considerably expanded Medicaid eligibility… It turns out that the 2015 per-capita cost of this Medicaid expansion is a whopping 49% higher than projections made just one year before. 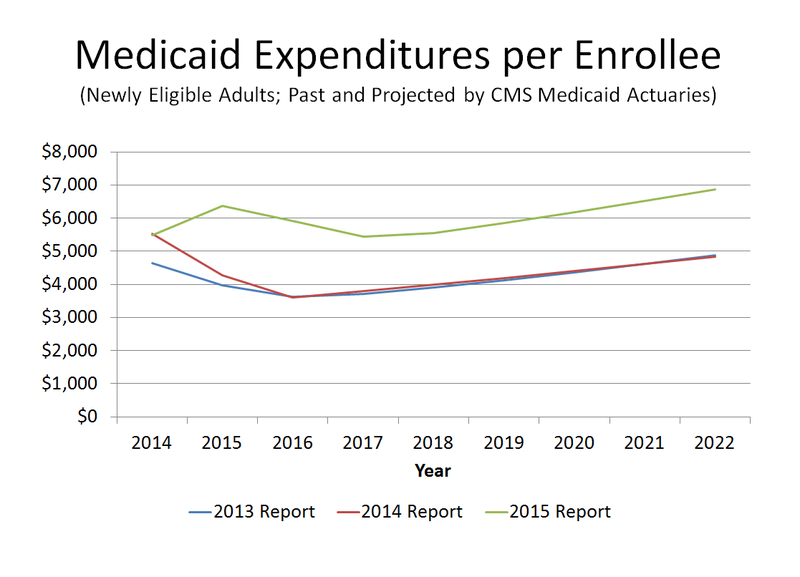 This disclosure can be found on page 27 of the 2015 Actuarial Report for Medicaid, released this July. Here’s the chart showing how much higher per-recipient spending will be according to the new numbers. Blahous goes through a lot of technical information to explain why the previous forecasts were so inaccurate. But here’s the part that I think is most important to understand. Obamacare created a free lunch for states, at least in the short run. So we shouldn’t be surprised that many states have been seduced into participating and that they’re now spending money like drunken sailors. Basically states established far higher expenditure requirements for the expansion population than the federal government expected, by positing that beneficiaries would be in need of more health services. Why did this happen? Remember, the ACA established an initial 100% federal matching payment for state Medicaid expansion costs, contrasting with historical federal match rates that averaged 57%. Even when the feds paid 57% of the bill there was a longstanding concern that states were insufficiently accountable for their cost-expanding decisions, with much of that cost being shifted to federal taxpayers. But the ACA’s current 100% match means that states make the decisions about expanding Medicaid while the federal government picks up all the costs. Even after the ACA is fully phased in, the feds will still pay for 90%. Under such arrangements, cost overruns are predictable. So what’s the obvious conclusion? Having federal taxpayers pick up between 90-100% of the cost of state Medicaid expansions was one of many questionable policy decisions made in the ACA. It’s also proving to be much more expensive than the federal government expected. Brian Blase of the Mercatus Center also has a grim assessment on the numbers. The Department of Health and Human Services’ (HHS) annual report on Medicaid’s finances contains a stunning update: the average cost of the Affordable Care Act’s Medicaid expansion enrollees was nearly 50% higher in fiscal year (FY) 2015 than HHS had projected just one year prior. Specifically, HHS found that the ACA’s Medicaid expansion enrollees cost an average of $6,366 in FY 2015—49% higher than the $4,281 amount that the agency projected in last year’s report. The government’s chief financial experts appear not to have anticipated how states would respond to the federal government’s 100% financing of the cost of people made eligible for Medicaid by the ACA. It appears that the enhanced federal funding for the ACA expansion population has led states to set outrageously high capitation rates—the amount government pays insurers—for the ACA Medicaid expansion population. Blase points out that this goes beyond the traditional failure of bureaucrats to accurately anticipate behavioral changes when politicians give away other people’s money. There’s also some sleazy maneuvers to funnel money to special interest groups. …the amounts…suggest that states are inappropriately funneling federal taxpayer money to insurers, hospitals, and other health care interests through the ACA Medicaid expansion. …The health care interest groups within the states, particularly hospitals and insurers, benefit from the higher rates while federal taxpayers are left footing the bill. …Moreover, the elevated federal reimbursement rate removes the incentives for states to make sure that insurers are not overspending on providers since overpayments come at the expense of federal, not state, taxpayers. And most of the new spending does wind up in the pockets of the interest groups. Recent evidence that new Medicaid enrollees only receive about 20 to 40 cents of benefit for each dollar of spending on their behalf. But even the small fraction that goes to consumers doesn’t seem to have much positive impact on their health according to one major new study. Medicaid expansion in Oregon was not related to significant health improvements. Obamacare has been a disaster. This column has been a look at how just one provision has backfired on taxpayers. The law has been a boon to insiders and interest groups. The diversion of Medicaid money to interest groups is just one chapter in the story, sort of like the bailouts for insurance companies. And just as bureaucrats are grossly incompetent at estimating the revenue impact of changes in tax law, they’re also grossly incompetent at predicting behavioral changes when expanding entitlement programs. Some of us, for what it’s worth, warned about this as Obamacare was being debated. P.S. Since I don’t want to be a naive rube, allow me to acknowledge there’s an alternative explanation for consistently inaccurate fiscal forecasts from the government. If you’re a bureaucrat at the Joint Committee on Taxation and you over-estimate the amount of revenue generated by a tax hike, that’s good news for politicians since it enables more spending. If you’re a bureaucrat at the Congressional Budget Office and you under-estimate the cost of a new program or program expansion, that’s good news for politicians since it enables more spending. Rather convenient the way that works, wouldn’t you say? In Oregon, once you are on Medicaid, it is nearly impossible to get off. This has been discovered by my daughter and a number of those she works with. She has paid for private insurance the past two years and was told it would over double as she was still listed as having Medicaid, although she had notified them of her private coverage numerous times and requested termination. It took the intervention of her US Representative to get her name removed from Medicaid rolls. Seems like fraud on Oregon’s part. States hunger for those federal funds and are loath to part from them. Government “benefits” are like flypaper. The problem with federalism is that you eventually run out of other states’ money. But there is no recommendation. What good are facts if there is no conclusion? I like your work, but the implementation of the remedy is more important that pointing out the continued and regular failings of big government. One in Washington could throw a rock in any direction and hit some major failing without error.